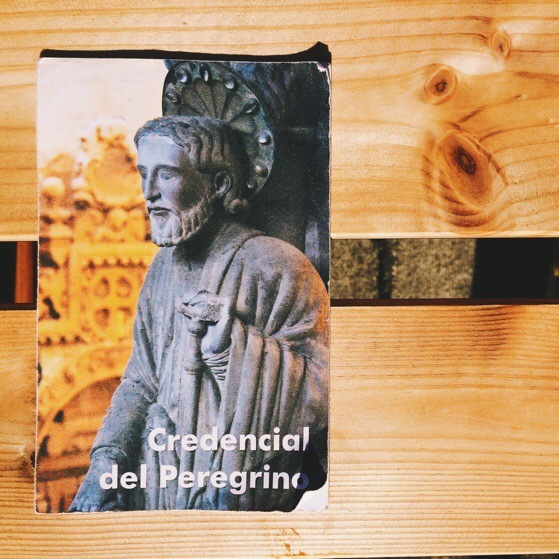 Your credencial or the Pilgrim’s Passport is an essential part of walking The Way. We were told that we would need our first stamp from one of the three churches in Sarria, where we were beginning our journey. Up on a hill we found a monastery, a place for pilgrims to worship and pray, as well as sleep and eat. We all four had our passports stamped to mark the official beginning of our pilgrimage, and then we spent a few minutes wandering the cloister of the monastery and listening to the church bells ring. 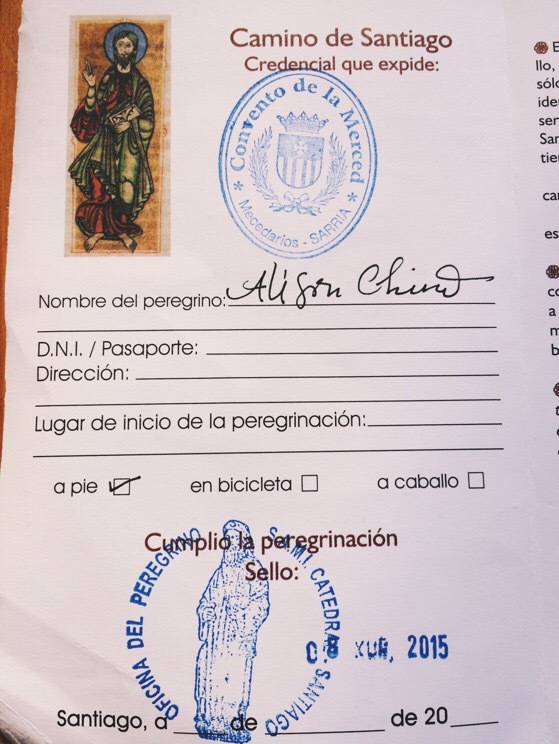 If you walk 100 kilometers (or bike 200 kilometers) to reach Santiago from any direction, you earn a Compostela, a certificate that has been issued for centuries to prove that you have made the pilgrimage. This document used to ensure your entry to the hospital in Santiago for three days of restoring you to health after your long walk. 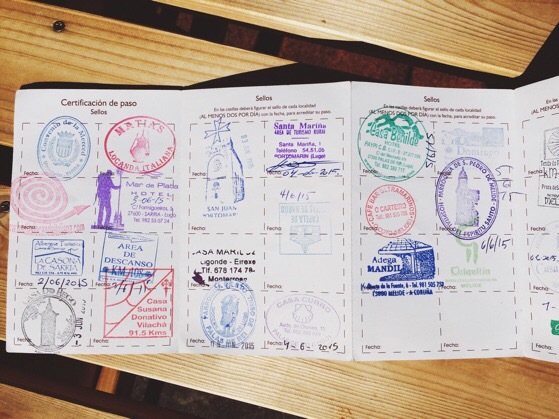 In order to show that you have made the journey, you get stamps in your Pilgrim’s Passport along The Way. 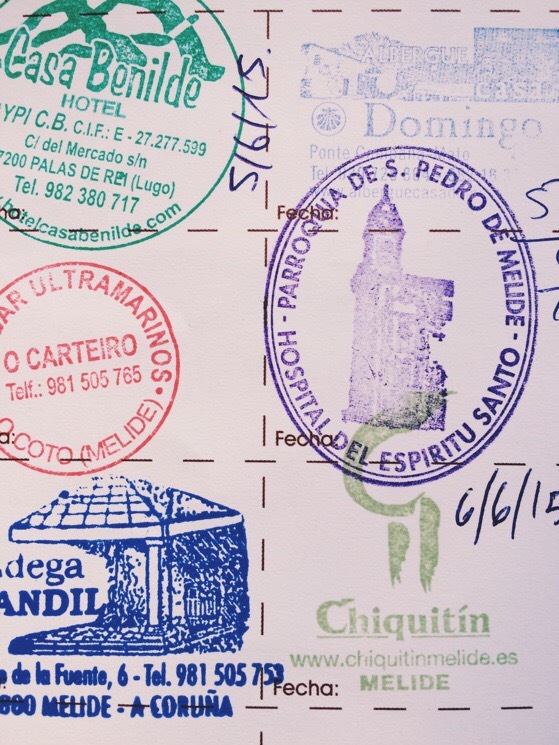 Every shop, restaurant, church, hotel and hostel has a stamp, so your passport becomes a colorful memento of the Camino, a reminder of all the places you stopped. The upside down stamp of a small roadside chapel is a memory of the blind man stamping passports at the door. The small arrow is where I bought a bracelet for my daughter. The winding road stamp was our favorite hotel. How lovely to have the names recorded of all the places where we shared meals together or stopped for drinks with friends. And of course one of the first stamps in the book is from Marcela, who set us on the right path our very first day. 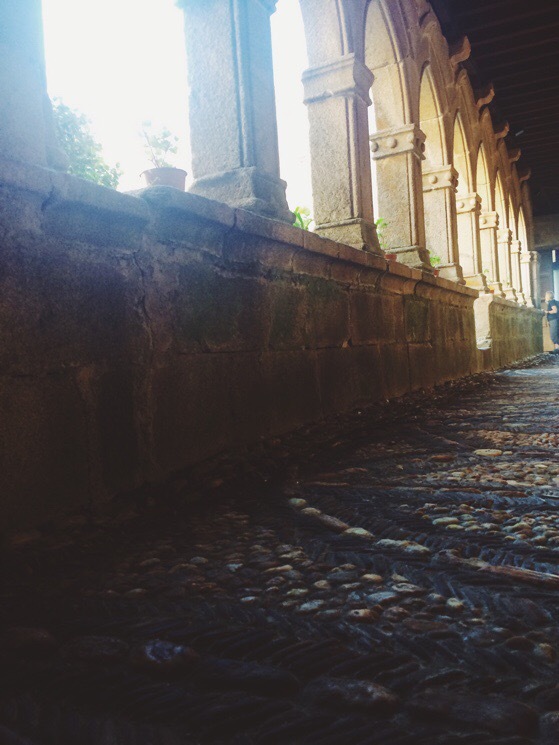 At the Pilgrims’ Office in Santiago de Compostela, you receive your official stamp of completion, and they ask you why you took your pilgrimage and issue you your Compostela. But my certificate of completion is not nearly as dear to me as the worn paper that carries the marks of our journey. On the back of it is a map of the many routes to Santiago, so when I pull it out I study the road I hope to walk next. Our journey along The Camino de Santiago was made possible by Macs Adventure, who found us the most wonderful places to sleep and made our giant suitcases magically appear in our rooms each night. 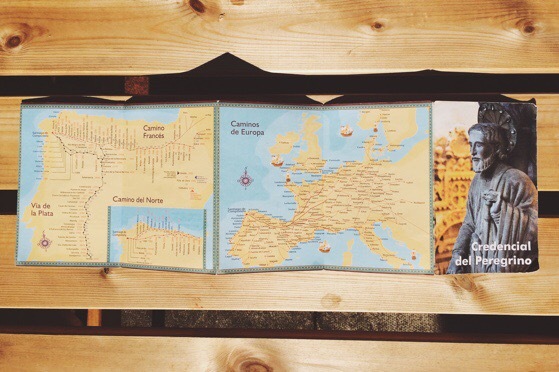 You pick up your Pilgrims’ Passport from a church in Sarria or wherever you begin, but our passports were waiting for us in our packets from Macs Adventure when we arrived at our hotel in Santiago.